If you pay attention to dictionaries and encyclopedias, the definition of “religion” has broadened significantly over the past thirty years or so. Most dictionaries described religion solely in terms of devotion to a god or deity, although these days Wikipedia defines religion as “an organized collection of beliefs, cultural systems, and world views that relate humanity to an order of existence.” It’s a much vaguer and more inclusive definition, one that reflects a greater interest and acceptance of world religions. But for better or worse, “religion” remains a Eurocentric term. Describing a set of cultural practices as a “religion” ascribes them broad similarities with the modern European understanding of Christianity. The term is also inherently political, so broadening the definition allows other organisations to share and contest some of the power and legitimacy held by the dominant religious institutions. What that means is that while there might be useful reasons to describe Shintoism and Buddhism as religions, it doesn’t capture the full picture of how they function in Japanese society. It’s impossible to pin down religion as a discrete, compartmentalised aspect of the human experience. Religions are constantly changing as they interact with other aspects of society. They cannot be reduced to mere superstition or irrational groupthink, as they are so frequently stereotyped. That all sounds like common sense, so here’s the important part. If there are multiple religions, there are also multiple secularisms. My idea of secularism would not be the same as a Japanese person’s, because societies tend to define what is “secular” alongside what is “religious”, and neither can be easily separated from “culture”. For instance, even though I identify as a non-believer, culturally I’m a Catholic and I won’t pretend otherwise. I went to a Catholic school, I attend weekly Bible study meetings, and I have a poster of Jesus in my bedroom. Moreover, cultures tend to be influenced by the dominant religious ideologies, even in countries with a formal separation between religion and state. People tend to speak of a “political Islam” but not so much of a “political Christianity” or a “political Judaism”, which tends to suggest that the Judeo-Christian worldview is normalised, to the extent that it can masquerade as secular. It’s particularly important to remember that there are multiple kinds of secularisms when talking about Japanese spirituality, because it’s tempting to think of Japan as a country of little religious faith, rather than one of fragmented faiths. The Yomiuri Shimbun has conducted multiple polls over the years, and they all point to a similar conclusion: many Japanese people may practice Shinto and Buddhist customs, but they do not possess much religious faith. Do you ever sense in the natural world something that transcends the power of human beings? The majority say yes – they do believe in something. Do you feel a sense of reverence for your ancestors, or not? There’s an overwhelmingly high yes response here. This suggests that the high participation rates in Shinto and Buddhist community rituals (78.3% attend the Obon Festival, and 73.1% visit a Shinto shrine at New Year’s) derives from a sense of tradition rather than religiosity. Reading a little between the lines here, I’d suggest that, broadly speaking, Japanese secularism defines itself mainly by its opposition to the organised religions of foreign tradition. According to this view, the traditions of Shintoism and Buddhism don’t really “count” as religion but rather as a set of philosophies or a way of life. So yes, religion does in fact have a strong presence in modern Japan, but it tends to be underplayed, not least by the Japanese themselves. As for anime, it’s tempting to think that they only make use of religious symbols in a superficial way. Even the creators themselves may think that way. 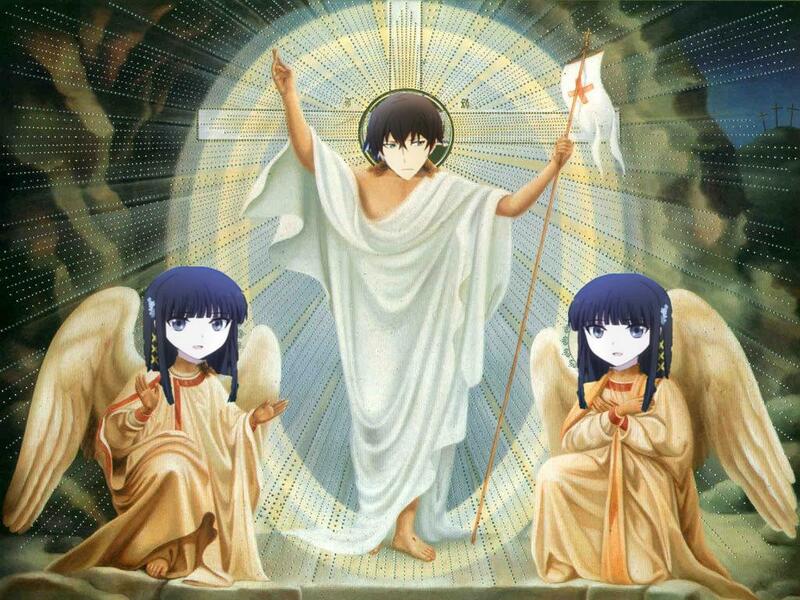 (See: The religious symbolism in Neon Genesis Evangelion.) But in reality, one’s understanding of what is “spiritual” is drawn from history and the various religions one has been exposed to, neither of which lend themselves to easy interpretation. I’ve said that Noragami is an example of a work of pastiche, but I also think the concept of “Japanese religion” is pastiche as well, invented to suit political ends. Buddhism originated in India and eventually spread to Japan in the sixth century via China and Korea. Japanese Buddhists developed many different sects, which were all very fascinating but I won’t talk about here. It was only during the 1600s that it was legally required for everyone be a parishioner of a Buddhist temple so that no one would convert to Christianity. At this point, families could only belong to one sect, and so the same traditions became entrenched over the generations. Policies like these enabled the general practice of ancestor worship, but it was Neo-Confucianism that actively encouraged it during this period. Neo-Confucianism, a revival of classic Confucianism, was imported from China and adopted as a guiding philosophy. There’s a lot of debate over whether Confucianism should be considered a religion; my take is that is one, and that it takes the form of ancestor worship in particular. Towards the end of the Tokugawa period (that is, towards the end of Japan’s self-imposed isolation from the rest of the world), Neo-Confucianism and Shintoism became popular in tandem, and after the Meiji Restoration in 1868, they dethroned Buddhism as the official state ideology. Shintoism began (and, in many ways, still remains) as folklore, with no real unifying elements between local customs. The Kojiki and Nihon Shoki, the earliest compilations of Japan’s oral history, made out that all of Japan was united under the Yamato race, but that’s mostly propaganda. Still, by using the myths from the Kojiki and Nihon Shoki as a foundational text, the Meiji government was able to construct a national religion. Amaterasu, who was relatively obscure until then, was promoted to the most important of Kami, and naturally, the Emperor was her direct descendant. This was done to for three main reasons: to legitimatise the Emperor, to unify Japan and to resist Western imperialism. It was around this time that the Japanese word for religion (shūkyō 宗教) was coined as a translation for the English word, so you can see that the invention of religion was a direct response to Western pressures. Because Buddhist principles clashed with the new national myths, the Meiji state outlawed Buddhism. But Buddhist customs were so ingrained at every level of society by this point, so that didn’t really work. What happened instead was that Buddhist beliefs were suppressed and Buddhist monks lost work, but the general Buddhist way of life continued. At the same time, the Emperor was “sacred and inviolable” (article 3), so any religion was fine and dandy as long as it did not get in the way of Emperor worship. In that way, the Shinto state became above religion – it became the natural order of things. After World War II, U.S. intervention dismantled the Shinto state. Shintoism retained its status in society as “the natural order of things”, but it lost its nationalistic and militaristic elements. Or perhaps you could say those aspects were sublimated. The Yasukuni Shrine remains controversial to this day because it links Shinto and ancestor worship directly with Japan’s imperial past. Thus, you can see how religion and politics have always been closely intertwined in Japanese history. Shintoism and Buddhism are conceived as formal religions when it suits political ends; otherwise they’re not really religions. To interpret this cynically, it’s a case of having one’s cake and eating it too. Japan is oh-so-unique and secular and accepting of different religions. No religious wars in Japan, amirite? No hate against Muslims either, just for the record. 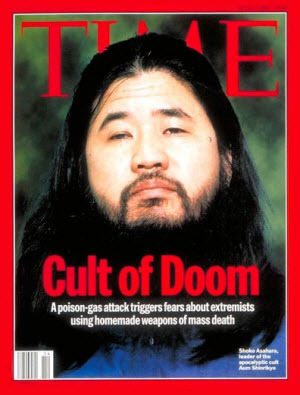 However, to be fair, some of the modern antipathy towards organised religions may stem from the sensational Tokyo gas attacks in 1995, which were carried out by Aum Shinrikyo, a religious cult. At the time, the media tended to conflate “religion” with “evil cults”, and this attitude probably still has appeal today. At any rate, the important takeaway is that religion has always been important in Japan, even if that may not seem obvious at first glance. 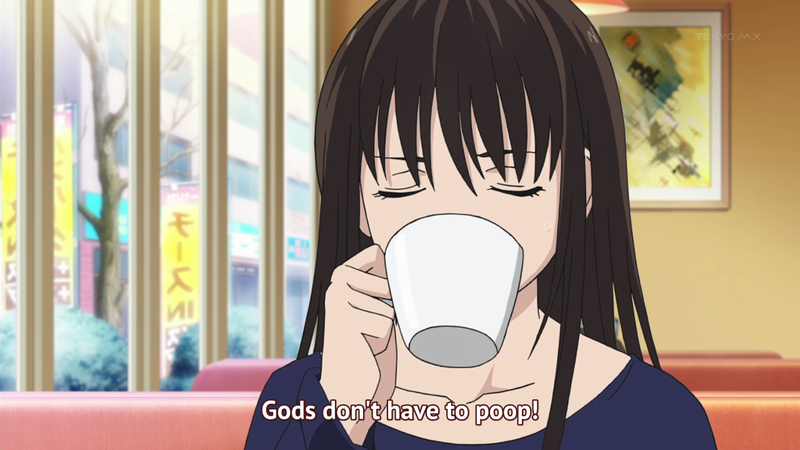 Because religion itself is constructed and in a constant state of flux, anime depictions of religion also tend to come across as messy. It’s no surprise that it’s not immediately obvious to the viewer how an anime would reflect the roles of Buddhism, Shintoism, Christianity and other religions in Japanese society today. I’d argue that the very fact that it’s not obvious points to the extent to which religion and secularism go hand in hand. What made the show particularly interesting to me, especially in the early episodes, was how it depicted a Kami’s struggle to stay relevant in modern times, when everyone seems not to care about religion. Even though I just spent a whole essay arguing that religion has been instrumental in forming the Japanese cultural identity, it’s true that active religious participation has been on the decline since the end of World War II. Like other anime which depict the struggle of Japanese folklore figures to modernise (e.g. Pom Poko, Natsume Yuujinchou), there’s a hint of nostalgia for the days of yore. But Noragami is mostly concerned with updating the Kami and showing them off as hip and cool, and I have to say Adachitoka really succeeded there. To me, it seems the rise in popularity of young adult fantasy stories reinterpreting traditional Japanese myths has coincided with a general spiritual revitalisation. New Kami are getting invented every year, and spiritual Power Spots are all the rage. But that’s something I need to research further before I can draw conclusions about it. 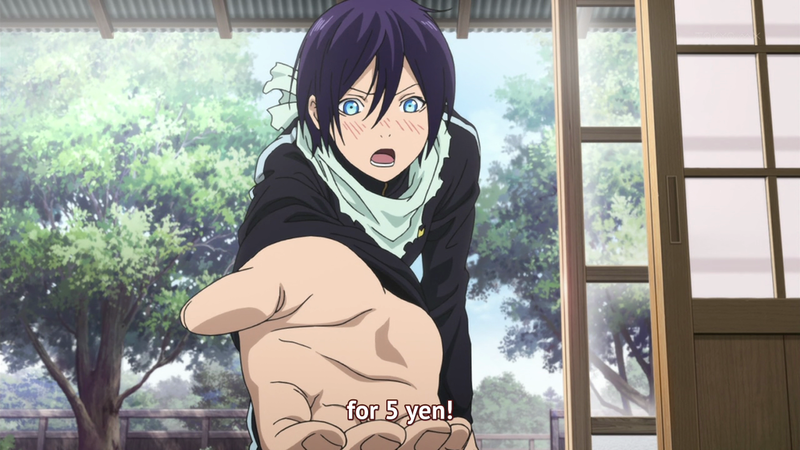 The other aspect of Noragami that was really clever and on-point was its depiction of Kami (especially Yato) as money-crazed. It’s a nod to how darned commercialised Shintoism is. There’s a Japanese saying that goes like this: 苦しい時の神頼み, which I’ve seen translated as “Danger past, god forgotten”. People basically pray when they want something, which is why Tenjin, the Kami of scholarship, is a hit with struggling students and has chain shrines all over the country. So yeah, Noragami is a pretty neat showcase of the ambivalent role of religion in a seemingly secular society, along with the perennial search for something genuine. Posted on June 11, 2015, in Editorials and tagged aum shinrikyo, buddhism, haibane renmei, haiyore nyaruko-san, jesus tatsuya, natsume yuujinchou, neon genesis evangelion, Noragami, pom poko, Puella Magi Madoka Magica, religion, shinto. Bookmark the permalink. 43 Comments. >For instance, even though I identify as a non-believer, culturally I’m a Catholic and I won’t pretend otherwise. I went to a Catholic school, I attend weekly Bible study meetings, and I have a poster of Jesus in my bedroom. Yes! I keep plates embossed with Quranic verses above my door, and I’ll be fasting all of Ramadan and probably volunteering at the mosque during the month, but actually going to the mosque is an opportunity to organize my email accounts and maybe watch something on Crunchyroll during the “sermon”, and doing some stretches while praying. The notes about Buddhist suppression following the Meiji Restoration reminds me superficially of Akhenaten’s suppression of Egyptian polytheism and the Ra cult in favor of something like monotheistic worship of Aten, in the 1300’s BC. Granted, I imagine the circumstances were quite different. Also, it’s interesting you talk about “deeper connection through their commercialised rituals”, because the images you linked are of Hiyori and Yato, and I don’t think I need to tell you they’re basically a canon ship (even if Yato x Veena is much more hilarious.) It makes me wonder about “loving a person” in the worship-sense, and “loving a person” in the romantic sense. The former keeps a separation between people (recognizing there is someone above you), but the latter is (ostensibly) about equality. 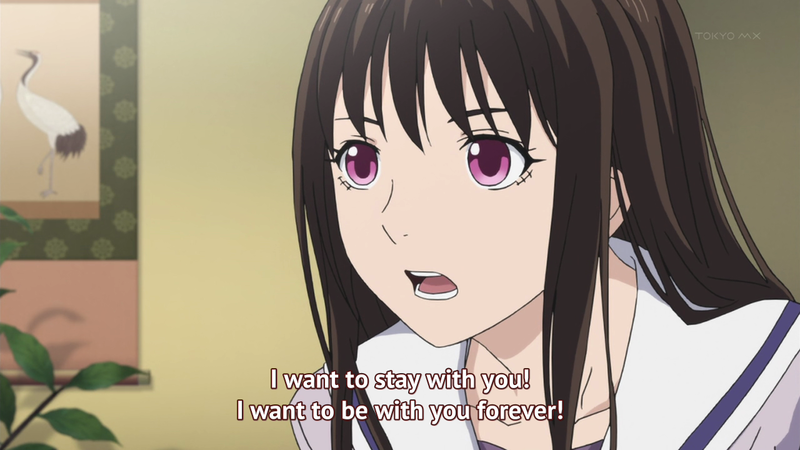 Can Hiyori worship Yato if she loves him? It makes me wonder about “loving a person” in the worship-sense, and “loving a person” in the romantic sense. The former keeps a separation between people (recognizing there is someone above you), but the latter is (ostensibly) about equality. 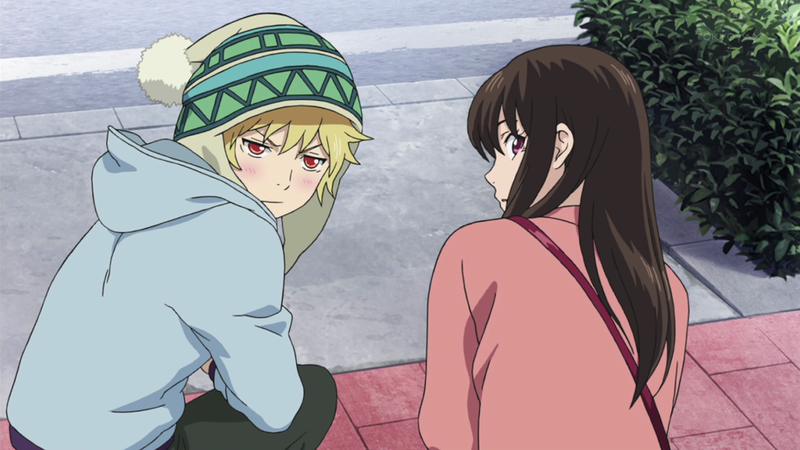 Can Hiyori worship Yato if she loves him? This is an interesting question, especially when we consider that Noragami is hardly the only the show to depict a romantic relationship between a Kami and human (there’s Kamisama Hajimemashita, a bunch of individual episodes in Natsume Yuujinchou, Inari Konkon Koi Iroha, etc.) I think it indicates that the Kami’s position as an object of worship has eroded a lot, but they still retain something exotic and divine about them, hence why they’re so desirable as love interests. Also, I know that Yato and Hiyori are supposed to be an item, but damn it, I can’t help but see them as friends with a really deep bond. Either way, I think that they develop a deeper connection as time goes on which would not have been possible if Hiyori did not become immersed in the spiritual world. I would note, also, that that the Bible is very big on comparing the love between lovers with the love between God and believers. There’s an inference that the entire structure of relationships between people, including that between married folks, is meant to demonstrate how God loves us, and in return how we should love God. And though I wouldn’t say this shows a type of equality between God and humans, it at least demonstrates the lengths of God’s love through servility and humility, rather showing the all-powerful Christian God meeting us at our level than becoming like/the same as us. The concept of romance being equal between partners is a recent development. Classic depictions of romance tend to revere the inequality, such as in the chivalric model. Another way to argue this is that the highest form of love would appear to be the desire and will to do anything for the object of your love. Is this any different from worship? Again, there are classic pick-up lines in the chivalric model of romance that are basically “you are my goddess, I will worship you to the end of my days.” In the sense that devotion and worship could be conflated, then yep, it’s still love! What I find interesting is that despite the rise in secularism, there are certain offshoots of religion that not only resist becoming more secular, but also seem to become more fundamentalist throughout the years, such as certain militant Buddhist movements in Myanmar, and offshoot Islamic movements in certain Middle Eastern countries. So compared to the secular movements, what would cause a religion to maintain and strengthen in fundamentalism? You got to somewhat careful with how you use “fundamentalism” and “secularism” because of how it means different things with different people. There are religious individuals who see secularism as anti-religion. There are religious individuals who identify themselves as fundamentalist and non-violent. Additionally, it’s not as though any one religion is a monolith. Not all Christians who face the same stimuli, for instance, become more “fundamentalist.” Christianity doesn’t become more “fundamentalist” as a whole. Certain parts do because of certain people do. What I see you vaguely mean as “fundamentalist” is parts retrench-tionist and revisionist, hostile movements. Certain religious individuals are being persecuted because of their faith or being corrupted from their faith. These certain individuals decide the way to protect themselves and their faith from persecution and corruption is is to “return” to a worldview and values that find their validity in original tradition. They find this worldview and these values as challenging, demanding, and thus fulfilling in ways that alternative ones are not. However, this is less an objective “return” to original tradition as what they “imagine” is an objective “return” to original tradition. This “return” to the fundamentals is more than conveniently antithetical to the normative, orthodox, and mainstream. That could be what’s considered moderate as well as secular. In this light, if you replace “religious” with “irreligious,” you get “fundamentalist secularists” who feel persecuted and/or corrupted by religion. I’d also add that while Aum Shinrikyo is widely considered a New Religious Movement, it’s fundamentalist in all the ways I described save for the fact that that it arguably doesn’t have an original tradition to turn to for moral and spiritual guidance. He’s talking specifically about Thatcherism here, but his ideas are applicable to all sorts of fundamentalist ideologies. They’re very often reactionary, defining themselves purely in opposition to a perceived threat. It’s not so much about religion, per se, but about the complex processes of social change and how this can give rise to reactionary movements. It’s also acknowledged by social scientists that modernisation has an uneven effect in different places. It may lead to secularism in some countries and it may also create an environment in which older forms of worship are reinvigorated and new forms of religion flourish. To use another Japanese example, Ainu religion is being revived these days. Now that the Ainu are finally recognised by the Japanese government as an indigenous people, many Ainu are attempting to rediscover their culture. They create this culture – it doesn’t come out of nowhere. So yeah… modernisation is complicated. That comment you made about the Ainu’s somewhat similar to how Native Americans in the 1960s and 1970s “rediscovered” their own native cultural and spiritual heritage. A lot of it had to do as much with guesswork as it did actual rediscovery. I remember watching a snippet from this film where young male Native American activists were trying to imagine themselves as strong and stoic warriors and hunters despite the fact that not all of them hailed from tribes with histories of warring and hunting. Additionally, the so-called spiritual tome for Native Americans during the Civil Rights and Red Power Movements, “Black Elk Speaks,” was written down from the testament of an Oglala Sioux. However, non-Oglala Sioux and even non-Native Americans were inspired enough by the text to incorporate it into their own spiritual regimen. Speaking of Aum Shinrikyo and cults if you didn’t happen to know, “cult” for the Japanese was an originally Western concept. The Japanese just appropriated it. Out of curiosity, are you talking about the kanji compound “崇拝” or the katakana word “カルト”? Ah, okay. Katakana words are meant to denote loan words and foreign concepts. I’ve also seen Aum referred to in Japanese as “崇拝” and I’m less certain about the etymology of that word. The two characters mean “adore” and “revere”. I’ll have to ask my language teacher about the connotations and whether the word reflects a subtly different understanding of cults. Yeah, the possible nuances for that are beyond me and my piss-poor Japanese. You mentioned that you attend bible studies (it sounds as if you currently do so). For Protestants, bible studies seem to be a place where believers can talk about Christianity in earnest or get their “seeker” questions answered or form bonds of friendship/family, but rarely a place to feel the cultural side of religion. As a non-believer, I wonder, do you attend bible study for cultural reasons, or for something else? It’s kind of complicated for me! I’m interested in the literary/historical side of the Bible, and that’s the angle I focus on when I study by myself. But when I attend the group, we mostly just read passages from the Bible and talk about God and how our day has been. I guess for me it’s a way of staying connected to the Christian community. I don’t live near a church these days, so it’s the best I can do. Interesting – that makes sense. Thanks for sharing! 1. You might find this interesting to peruse. 2. Genre shows with supernatural elements have always tended towards recontextualizing classic folklore. Some do it as their very premise, tackling and adding a new myth to the pastiche every week. (Xena, Grimm, Buffy, Librarians, Lost Girl, Teen Wolf, etc.) Others are a little more selective in their appropriation, such as in Avatar: The Last Airbender, Bleach, Disney Princess movies, or Fate Zero. But regardless, at least for me, it points to a separation between the concrete symbols (the gods themselves) and the beliefs they originally represented. “something that transcends the power of human beings” exists, but it is not necessarily the exact mythological figures of old. The stereotype of the American agnostic is someone who feels that there’s a higher power out there, but whoever they are, they probably ain’t Jehovah or Allah. In other words, the traditional Grand Narratives of religion have been fragmented in to elements that have been databased. 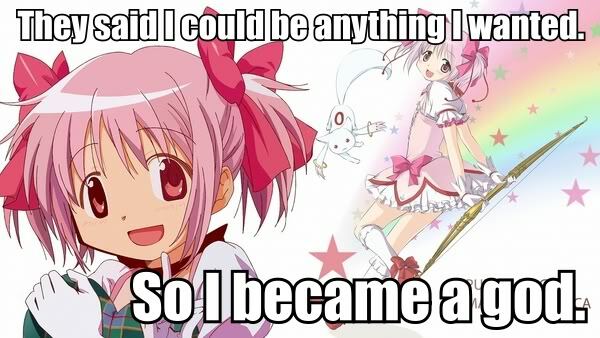 The underpinning spiritual beliefs can be utilitized as themes, implemented independent of any explicit religious origin, such as in Madoka, or with superheroes. Traditional symbols can be wielded as purely aesthetic elements, or combined with new beliefs, in inversions/subversions or just straight reimaginings of their purpose, such as in Evangelion. And the original religious figures are databased as characters, and can be adapted to each narrative with any character tropes, such as with Nyaruko. And in Noragami, we have gods as characters, supernatural powers as aesthetics, and the spiritual beliefs? The show appears to go completely in the gods-as-characters direction, deriving themes from their characterizations, but ironically, as said themes are universal and have resonated with people since the beginning of civilization, they come back around to the ways in which people created religious beliefs as an answer to the questions posed by those themes in the first place. Discworld is, as always, relevant. He’s half Anglo, half Filipino I think? As Zero said, I’m half Anglo, half Filipino. I can’t explain the Vietnamese either. I don’t even know what it says. I got the poster from my grandmother, who probably got it from a market sale. So, uh… cultural appropriation at its finest? If I had to guess, the Vietnamese is probably something along the lines of “For the sake of His Sorrowful Passion, have mercy on us and on the whole world,” since that particular image of Jesus was specifically commissioned by a saint (Saint Faustina) as the representation of Divine Mercy. You’d know that, wouldn’t you? The manga’s a must-read, especially if you enjoy the character development and art. Most importantly, the later and latest chapters contain major reveals on God-Regalia relationships, God society, and the schemes of Nora’s ” Father”, mentioned in the finale of Season 1. Pragmatism, that word sums up the East Asian’s opinion to religions. In an agriculture economy, the world to one of our ancestor is limited to his village. The main purpose is to keep your bloodline survive. That is why we adopted closer-to-the-world philosophies and ignored the more complicated spiritual aspect. To us, there is not much of an “afterlife” as to Westerners. And that reflects on Noragami. On the other hand, are you saying that just Neo-Ruism is a religion, or it includes the older one? Certainly not the first one, since Confucius considered it to be a collection of topics revolving a man’s reflection and reactions to the sociology-political world around him. Of course, since his teaching based on older , so you could say that either way, it has spiritual influence in it – very much like Lin Yutang’s “The Importance of Living” centuries latter. It’s unavoidable to live in Asia without being influenced by religions. Oh, and why your Jesus poster is from Vietnam? are you saying that just Neo-Ruism is a religion, or it includes the older one? This goes back to the age-old (er, actually, relatively modern) question of what constitutes a religion. If we’re going by the super vague Wikipedia definition I quoted, then Confucianism would be considered a religion. It even has spiritual underpinnings, like what you mentioned. Of course, the question is much more complicated than that, because we generally associate religion with theism, which Confucianism lacks. And because a lot of Confucian moral teachings can easily pass as secular, Confucianism is seen as compatible with Buddhism/Christianity/etc. That’s why it doesn’t seem to “count” as a religion on its own. But as I’ve also argued, no religion can be put into a neat box. Very often, the “religious” and the “secular” intersect, so you have to take a broad view of religion and what it means to a particular society. That’s why I think it’s a good idea to examine Confucianism as a religion. Describing it as a religion doesn’t mean that it’s equivalent to Christianity, but if you just think of it as a moral philosophy, you’d be pretending it’s entirely secular, and that would cheapen our understanding of secularism. Either way, the debate about Confucianism goes much deeper than semantics. You can’t just look at Confucianism in isolation – you have to appreciate how it interacts with other religions and with politics, etc. Also, some people describe Confucianism as a “quasi-religion”. Perhaps that label sits better with you. 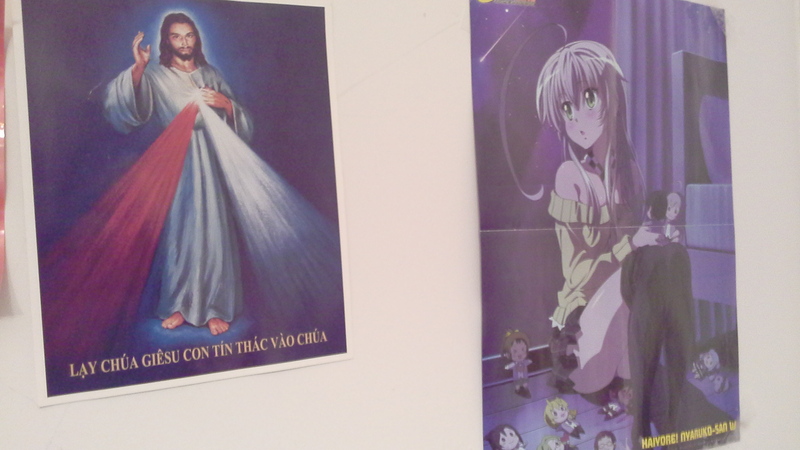 As for why my Jesus poster is from Vietnam… Well, I got the poster from my grandmother so I don’t really know the story behind it. But it’s a cool poster, right? The Spring and Autumn Period as well as Warring States periods saw a never before deterioration of authority, economy and morality. So, you could say that Ruism, as well as Mohism and others in Hundred Schools of Thought have a more necessity meaning: To better the current society with changing the individual first. Oh, and Froggy, could you do a post about cyberpunk OVA and movies of the 80s? It’s an interesting topic that has been rarely touched, and with the rise of Hollywood dystopian movies like Hunger Game. I’d totally do a post about cyberpunk OVAs and movies of the 80s! Try Cyber City OEDO, Battle Angel Alita and all variates of Bubblegum Crisis. C. K. Yang’s “Religion in Chinese Society” and Eric O. Hanson’s (my professor’s) “Religion and Politics in the International System Today,” define religions as those faiths which adherents follow and practice as matters of “ultimate concern.” It encompasses those non-religious zealots who follow ideologies like Confucianism, Maoist-Marxist Communism, and Radical Secularism “religiously,” or strongly enough they are willing to live and die for them on principle. This definition accounts for Western and Enlightenment ethnocentric conceptualizations of experiencing religion by including nontheistic as well as theistic beliefs. And once you get out of that hurdle, you’d be surprised to see how similar Maoist-Marxist dogma is to religious dogma. This also reminds me of Soviet Russia, where the Church was suppressed because it took focus away from the One True Way of Communism. And now, after the fall of the Soviet Union, the Russian Orthodox Church is thoroughly mainstream. (Three quarters of Russians consider themselves Orthodox Christian iirc.) So yeah, yet another case of a seemingly secular ideology masking a very religious spirit. First off—Nyarko poster want. Also, I love that she’s looking at Jesus. 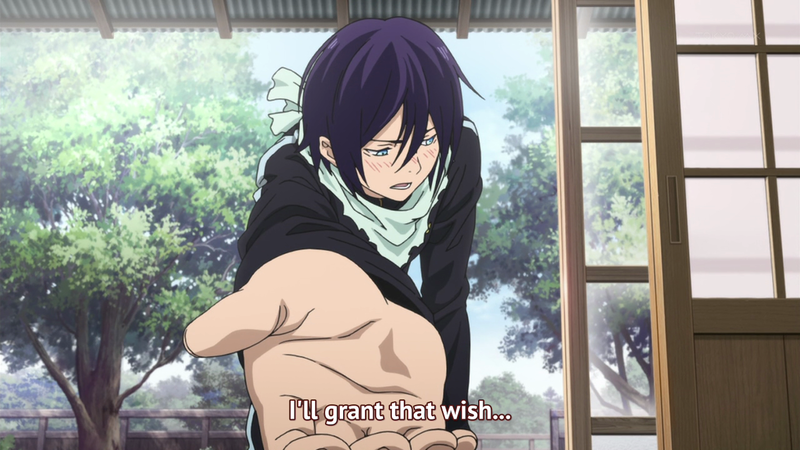 One thing I like about Noragami a lot is that, as you point out in your conclusion, the characters do make a connection beyond the commercialized religious activities of Yato. As someone who really values his particular religious faith and honestly believes that other people would benefit from “getting religion,” as well, I can really get behind the message that there actually is an authenticity to the spiritual relationship between human and G(g)od(s) behind the modernized commercial religious brands we so often see. And I do think there is some value in humanizing the faces of the gods, if only because it makes them more accessible. I just like that idea. And that is the inconclusive and not-very-neatly-tied-up conclusion to my comment. Also, I love that she’s looking at Jesus. And yeah, I agree. It’s easy to get cynical about religion(s) because of how commercialised/performed they are. But that applies to many things. As for finding authenticity, I think that’s become easier for me after I acknowledged that nothing is inherently pure or genuine. You can find something beautiful in even the most common and seemingly superficial of things. And I do think there is some value in humanizing the faces of the gods, if only because it makes them more accessible. It’s curious that you’d say that, because I’m sure there are some who would think that’s blasphemous. But I’m on the same page as you. Even among Christians, who believe in only one God, everyone has a different personal relationship with God, and that’s what makes the religious experience very human. One of the things I really like about Jesus is that he was human. He might have been exposed to temptations, but he always chose the morally righteous path. To me, the question of whether he was divine or whether he really existed are beside the point. Jesus’s story is personal. In response to the rise and “corruption” of the western politic/culture, us Muslims must return to the original tradition and reject any outside influences. Basically, while Islam accept anyone who wants to join us, but because of we’re “the right and the special one” we need to isolate ourselves from the world and pretty much reject and make enemies out of /everything/ not Islam related. Holy crap, that’s a pretty toxic philosophy to be teaching in high schools. I can’t say it’s all that uncommon, though, when you look at all countries across the globe.